VietNamNet Bridge – Artwork by more than 150 contemporary Vietnamese artists will be on sale at attractive prices during the ninth “Art For You” – an affordable art fair taking place in Hanoi this week. Organised by Manzi Art Space in collaboration with Work Room Four, the five-day event will present a collection of sketches, photographs, illustrations and paintings by some of the finest creative talents working in Vietnam today. More than 500 pieces by vibrant artists will be presented at the annual fair. Alongside talented contemporary practitioners, including Le Quy Tong, Nguyen Manh Hung, Bui Tien Tuan, Nguyen Huy An, Nguyen Tran Nam, Nguyen The Son and Sandrine Llouquet, emerging artists such as Le Thuy, Le Hoang Bich Phuong and Nguyen Dinh Hoang Viet will also introduce their work at the event. According to the organisers, the event is more than a place where art lovers can buy affordable art. “While art lovers can use Art For You as a place to discover something beautiful and give it a home, the artists can use it to exhibit and sell their works, connect with audiences and position themselves alongside their peers,” she said. At the fair, visitors can compare a variety of styles and mediums, with visual examples of a broad range of local artworks. One of Vietnam’s most outstanding contemporary artists, Nguyen The Son, who has presented his works at every edition of the fair, said, “Art For You has not only benefited the artists but the local community as well. It is a really effective way of bringing art to the public compared to other traditional shows." 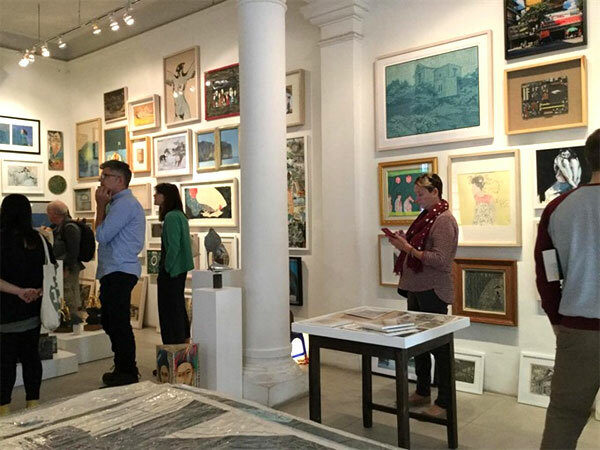 Since its first edition in Hanoi in December 2014, Art For You has been held successfully eight times in both Hanoi and HCM City, selling more than 1,800 works of art. The events welcomed more than 10,000 visitors, who paid over VND1.8 billion (about US$77,000) to artists. “To ensure we stay true to our vision – to exhibit, promote and sell high quality artwork made by artists living and working in Vietnam to a diverse audience at an attractive price point in an environment that is refreshing, contemporary and welcoming – we are keeping our prices between $25 and $900,” Tram said. Art For You will take place at Manzi Art Space, 14 Phan Huy Ich Street, Hanoi, from November 22 to 26, 9:30am-8pm.